Al Hartmann | The Salt Lake Tribune Natural gas rig pumps away in the foreground of the coal-fired Huntington Power Plant west of Huntington. 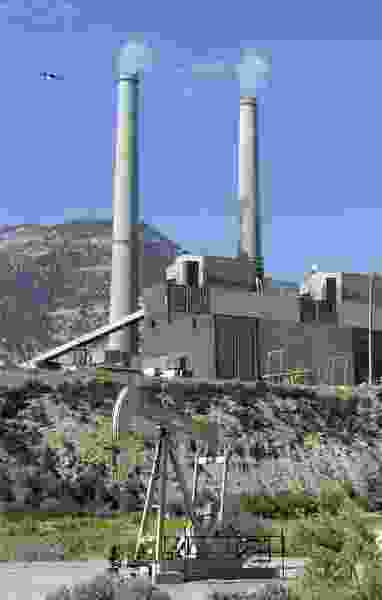 With the last union coal mine closing in Carbon County and coal mining industry on the decline in Carbon and Emery counties the area will have to look to new business opportunites to make up the slack in the economy. The recent article demonstrating that only 49 percent of people in Emery County believe climate change is real should not be a surprise. The denial of climate change is very similar to the denial of the link between tobacco and lung cancer that occurred especially in tobacco-growing areas of Maryland, Virginia and North Carolina for decades following the Surgeon General’s report in 1964. Disinformation by industry, industry-supported “scientists” and a lack of leadership from elected officials with regard to climate change follows the same pattern that delayed widespread action to curb the public health dangers of smoking. The question to ask is: Will our elected Utah leaders be leaders on climate change action, or will they copy the tobacco model and delay as long as possible?